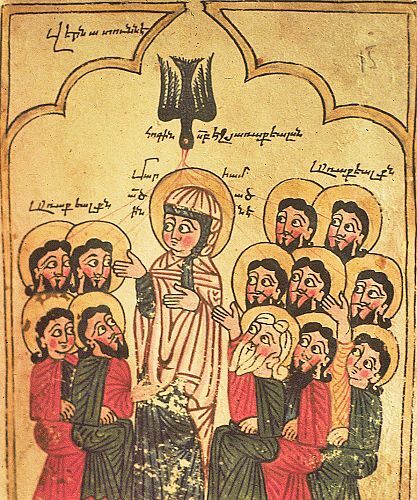 The episode of the Descent of the Holy Spirit (Hokekaloust, Pentecost) is the last of the many marvelous events and revelations of the New Testament. The date, adjusted, should be May 28 of the year 30. The Gospel contains only a vague reference to the Descent of the Holy Spirit. The event itself is described in detail in Acts 2: 1-12. Jesus’ life as a man, pre-ordained and truncated, had come to an end. It was necessary for the principles of the New Doctrine of life to be accepted by all nations. The New Testament, in contrast to the Old Testament, called for the singular “chosen” people to come out of their narrowly circumscribed existence and embrace all mankind with the new teachings and principles, without discrimination. However, it must be asked, what power did Jesus’ Apostles and their disciples have to be able to spread and establish the New Doctrine universally? It is well known that the selected Apostles were ordinary people of Galilee. Under ordinary and natural circumstance they would not have been able to transmit the Truth of the Word to the many peoples living in both the civilized and the non-civilized lands, of different cultures, and speaking different languages. The impossibility of carrying out the Great Apostleship (mission) under the given conditions was obvious and clear to Jesus. So He advised His disciples not to start their teaching immediately after the Ascension. Instead, he advised them to wait for the Descent of the Holy Spirit. It was an absolute necessity for them to be reinforced by its power in order to be able to convey the understanding and the conviction of the New Faith to distant nations and peoples. It was going to be undoubtedly necessary, under some circumstances, for the Apostles to be ready to sacrifice their lives for the sake of principles. Those to be mobilized, the Apostles and their disciples, needed to be armed with spiritual power, with indestructible faith, with languages, with optimism, with a vision of victory, and with other appropriate attributes for the purpose of teaching the noble principles and for entering the fray for success. Jesus made it clear that in order for the Apostles to be endowed with such virtues it would be necessary to wait for the Descent of the Holy Spirit. The occasion was not late in coming. “And behold, I send you the promise of my Father upon you; but stay in the city, until you are clothed with power from on high.” (Luke 24:49). And that took place just ten days after the Ascension. On that date, May 28 of the year 30, the foundation was laid for the rational temple of the New Doctrine. They were all filled with the Holy Spirit in the Upper Chamber. They were being steeled with those intellectual weapons with which they would be able to carry the New Doctrine outside of the boundaries of Jerusalem, Galilee, and Palestine, and spread the message to all lands of mankind. Pentecost was the mystery of the miracle of being imbued with mankind’s most noble virtues and capabilities of faith, hope, power, love, and willingness to sacrifice. With these, the establishment of the New Faith forever was being assured, and its certain spread in time and space. According to those especially versed in the Gospel of the times of the Pentecost, there were 120 persons in the Upper Chamber, all equally being endowed with the grace being granted. 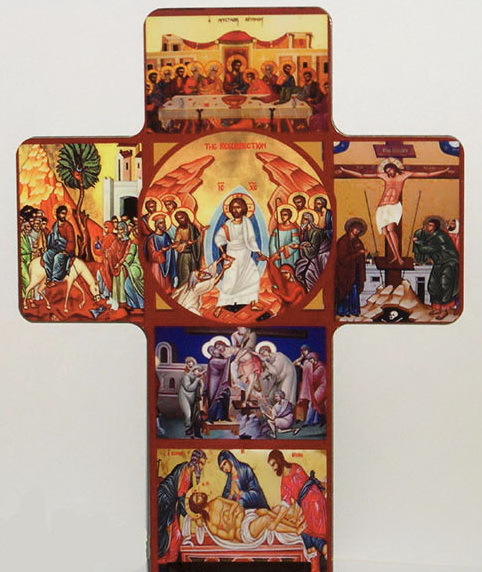 Those present were the Apostles, their disciples, the Mother of the Lord, the oil-bearing women, and others. Pentecost is regarded as the name-day for those bearing the names Kaloust, Mekhitar, Aghavni, Sirarpi. For them this day is a time for celebra­tion. 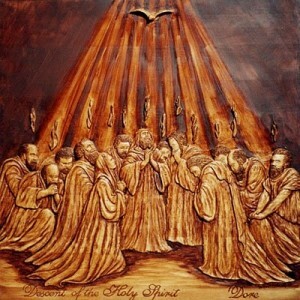 PENTECOST: Pentecost is mentioned in the Book of Acts, it was a consecrated feast day. According to tradition, when the Jews had their exodus from Egypt, the Passover, God issued his Commandments to the people through the prophet Moses on Mt. Sinai. It was Pentecost (50th day). In gratitude and thanks for that grace received from on high, the Jewish people established the Feast of First Fruits (Jewish Shabuouth, Ex 23: 16), meaning that the first harvest are to be dedicated to God. Animals were to be sacrificed; seven ewes, one bullock, and two rams. 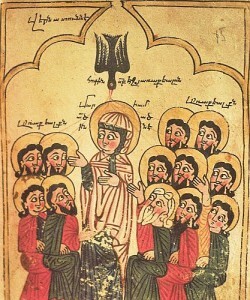 Thus, exactly 50 days after Jesus’ Resurrection, when the miracle of the Descent of the Holy Spirit was taking place, the Jews were celebrating their feast of Pentecost (in Armenian, Pentecoste), which over a period of time, through some confusion became the name given to the Christian feast of the Descent of the Holy Spirit.